Beck Games, Inc. is a Rhode Island corporation serving Central and Southern New England since 1982. We are a full service supplier and consultant providing the best and latest in amusement technology to the Family Entertainment Industry. Our locations range from large scale Family Entertainment Centers to venues including Children’s Entertainment Centers, Laser Tag Centers, Roller Skating Rinks, Movie Theaters, Colleges, Billiard Centers, and Night Clubs. 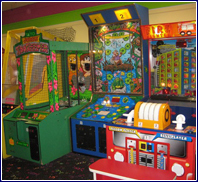 Beck Games also owns and operates Big Top Playland Arcade in the Hanover Mall, Hanover, Massachusetts. All of our locations are trained in redemption equipment management, purchasing and ticket pricing of merchandise, ticket and token maintenance, general machine operation, and related promotional avenues. Our organization provides routine equipment service that is flexible and sensitive to the needs of all of our locations. In addition to our leasing services, we also provide in home support for customers who may need technical assistance with their private collection of amusement equipment. Copyright © 2009 Beck Arcade Games, Inc.